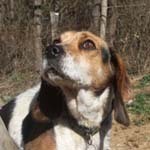 Maggie Mae is an adult spayed female Beagle. she came up from WV as her life consisted of living in an outside pen where she was punished for digging holes. She used to live in a house and is house trained, but at some point she was relegated to the outdoors. She is safe and warm now here with us and she is just a love. We think she's five or six and she's a very petite beagle with beautiful tickings and some large black spots, almost like a field beagle. She's purebred, though, and as sweet and friendly as can be. You would never know she was abused. 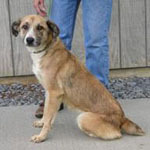 Kate is a two year old 50 pound shepherd mix who is one smart cookie. This little girl is so sweet and so very intersted in pleasing us! She would do great in any warm family setting and loves other dogs and doesn't mind our cats. She is so anxious to cuddle with her new people. 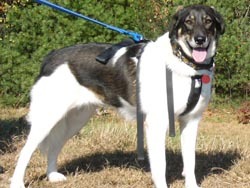 Brandy is a shy and sweet collie/shepherd mix about 3 years old who is completely housebroken and crate trained and gets along well with other dogs and cats. She enjoys rolling on her back in the grass, riding quietly in the car, walking in the woods and in the park, and chewing on large marrow bones. 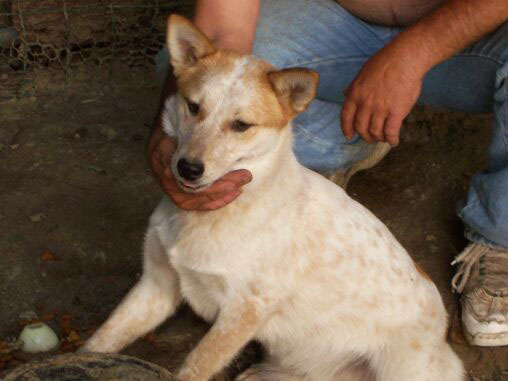 Champ is a beautiful Cattle Dog mix who is just adorable. He LOVES toys! He will "fetch" and sometimes will bring the toy straight to you and drop it; sometimes he'll run after it, sniff it, and then walk away from it. He's still got puppy teeth and likes to chew so please have lots of chew toys and puppy proof your house. He's going to make someone an awesome companion as he will never leave your side. He can be a little shy with men but has made great striides as the foster mom is socializing him. This adorable little dog was seen being thrown from a car, so a kind passerby stopped and picked him up, brought him to her vet, had him neutered and brought up to date on vaccines and everything. But she has other dogs and pets so cannot keep him. He is adorable and gets along with dogs, cats, rabbits, everyone. He weighs 14 lbs and is 99% house broken. 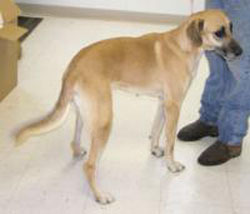 Leona is a young Great Dane mix. This dog IS a real sweetie. We understand now why the county let her slip beyond her kill date. What a nice girl. She was originally fostered with another dog and cats. She's a spaz (have I heard that somewhere before? ), but an extremely lovable spaz! She also calms down quite nicely once indoors. Yes, she jumps into the chair from behind (up and over the back without a second thought - sometimes with a bit of a running start coming out of the kitchen and into the living room - whoosh! ), but curls up quite nicely and sleeps happily. She will also jump into the bed of a pickup truck, with the tailgate up! They said she was strong on a leash, but that they worked with her a lot. A quick pop of the leash settles her down. The WV foster folks loved her personality, as did the folks at the clinic who decided not to euthanize, God bless them. We understand that she is great with kids. She was picked up as a stray with several other dogs in September, 2006. She remains "slight", but will get plenty of nourishment in foster care. She's on the small side (maybe because she was lacking for food for so long) for a Great Dane, but has the features. 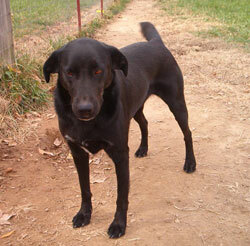 If you're looking for a real companion dog, Leona could be for you! She's young (less than two years old), and full of energy. 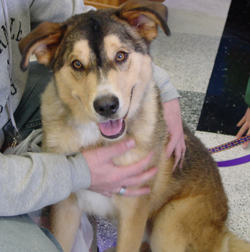 Mickie is a Siberian Husky mixed with collie. He has a collie head and Sibe fur and he is the biggest love bug. Found Mickie tied to the shelter fence. We are guessing his is a 9 – 10 month old pup, but the vet says he still has some growing to do. He's about 70 lb now so will be a big boy. But he is a gentle giant and has the most laid back personality. He loves to play with the other dogs but is extremely submissive. Despite his size, he's not a powerhouse at all. Immaculately clean in his house and pen area. Very friendly towards people, crates well, quiet, just a real gem of a dog. He needs some coaxing on leash, so will need leash work. All our dogs require obedience training anyway, so that's not a problem. Like cold weather and outdoor activities? This is the dog for you! He loves the cold and the snow. But he's not a dog to leave outside, no way. Please be a caring dog owner as Mickie deserves the best! Pluto is an adorable, somewhat timid but loving 2-3 yr. old Shih tzu. He is neutered and seems to be paper trained, though sometimes will forget if he's in another room, so will need someone to work with him reinforcing housetraining in a positive manner. Pluto was found living on the streets, matted and a mess, and had to be shaved down. He was very frightened in the shelter and of many hands handling him and not knowing his fate....When we took him in a copule weeks ago, he was skin and bones, but with good food and love and time, his coat will grow out and he'll put on some weight and be more handsome than he is now! He is very sweet, but is scared of loud noises, stern (mad) voices and cowers when he's had an accident (like he's been hit before). He absolutely LOVES attention and wants nothing more than to be with his people. He likes the gentle attention of older children, but because of his need for a quiet environment, we're looking for a mostly adult home (possibly with older children). He gets a little nervous at loud noises and when other dogs bark and he senses "danger". He's friendly with other dogs and will play with friendly dog(s) his own size,but is somewhat timid of the unknown (or dogs that have given him an attitude) in his foster home. He loves to chase and play with his tail, and will fetch a plush/squeaky toy and most of the time bring it back! He is smart little guy, eager to please, and with positive training, will shine, we are sure! Pluto is definitely a little prize. He seems afraid to go outside nad will run back to the door. At first he did his business, but now prefers to use the paper. We're not sure if he's just afraid someone will leave him outside and he's on his own or what....He needs reassurance and love to know that he's Safe and cared for. If you have the love and time to devote to Pluto, and can provide a forever home so that he never has to lose his home/people again, please fill out an application. Because he needs a good deal of socialization/training, we would prefersomeone who has alot of time to give him -- a stay at home adopter and/or someone who works at home or can take him to work with them. He deserves to be treated like a Prince, and in turn will provide you with tons of love and devoted companionship!